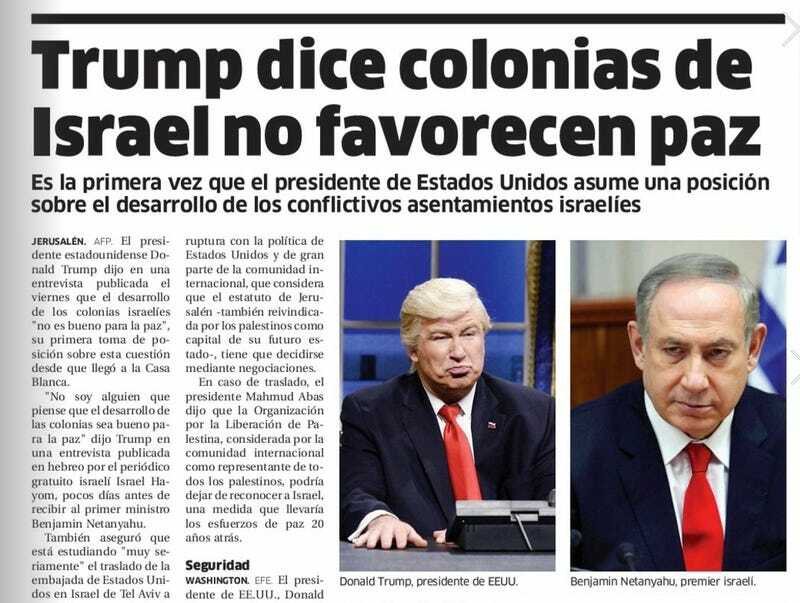 El Nacional published an article on Friday about President Trump’s views on settlements in Israel. The piece included an accurate photo of Israeli Prime Minister Benjamin Netanyahu, but the photo of Trump was a bit... off. The newspaper ran a correction, explaining that they had just pulled the photo from the Associated Press wire service and that it simply went unnoticed by everyone who reviewed it. Who among us hasn’t made that mistake, right? I mean, real life has become so absurd that it’s basically beyond parody at this point. The error has been picked up and ridiculed on social media, with plenty of people wondering if the Dominican Republic will now be added to Trump’s list of banned countries, referring to the seven predominantly Muslim countries from which Trump has tried to restrict travel. And sadly, they might not be wrong about countries from Central and South America getting added to the list. The Trump regime is expected to sign a new executive order on Monday, and one way that he might try to get around the unconstitutionality of banning travelers by religion is by expanding the order to include other “dangerous” countries—countries which could be predominantly Catholic, for instance, where many refugees are fleeing gang violence. With Trump’s Immigrations and Customs Enforcement stepping up deportations in the past week, it’s certainly a possibility. But here at Gizmodo we don’t want newspapers to be running fake news. So if you’re going to write about the president, we humbly suggest using the very real photo of Trump seen below.